CRESST-II (Cryogenic Rare Event Search with Superconducting Thermometers) is a dark matter search experiment located at the Laboratori Nazionali del Gran Sasson in Italy. It is primarily involved with the search for WIMPs, or Weakly Interacting Massive Particles, which play a key role in both particle and astrophysics as a potential candidate for dark matter. If you are not yet intrigued enough about dark matter, see the list of references at the bottom of this post for more information. As dark matter candidates, WIMPs only interact via gravitational and weak forces, making them extremely difficult to detect. CRESST-II attempts to detect WIMPs via elastic scattering off nuclei in scintillating CaWO4 crystals. This is a process known as direct detection, where scientists search for evidence of the WIMP itself; indirect detection requires searching for WIMP decay products. There are many challenges to direct detection, including the relatively low amount of recoil energy present in such scattering. An additional issue is the extremely high background, which is dominated by beta and gamma radiation of the nuclei. Overall, the experiment expects to obtain a few tens of events per kilogram-year. Figure 1: Expected number of events for background and signal in 2011 CRESST-II run; from 1109.0702v1. In 2011, CREST-II reported a small excess of events outside of the predicted background levels. The statistical analysis makes use of a maximum likelihood function, which parameterizes each primary background to compute a total number of expected events. The results of this likelihood fit can be seen in Figure 1, where M1 and M2 are different mass hypotheses. From these values, CRESST-II reports a statistical significance of 4.7σ for M1, and 4.2σ for M2. Since a discovery is generally accepted to have a significance of 5σ, these numbers presented a pretty big cause for excitement. 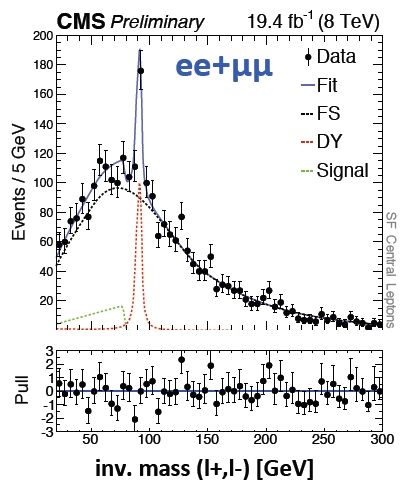 In July of 2014, CRESST-II released a follow up paper: after some detector upgrades and further background reduction, these tantalizingly high significances have been revised, ruling out both mass hypotheses. 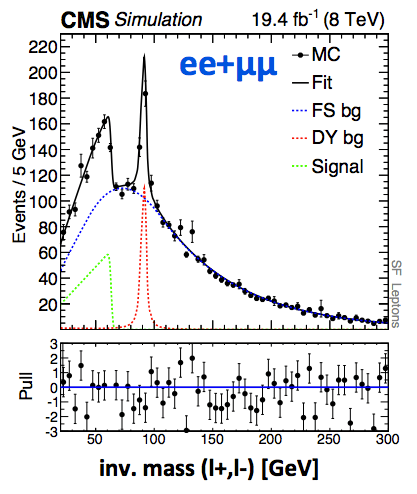 The event excess was likely due to unidentified e–/γ background, which was reduced by a factor of 2 -10 via improved CaWO4 crystals used in this run. 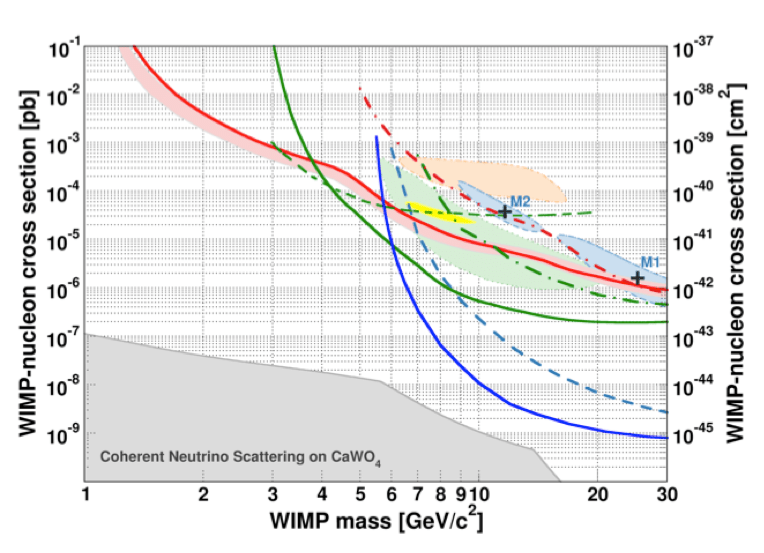 The elimination of these high signal significances is in agreement with other dark matter searches, which have also ruled out WIMP masses on the order of 20 GeV. Figure 2 shows the most recent exclusion curve for the WIMP mass, which gives the cross section for production as a function of possible mass. The contour reported in the 2011 paper is shown in light blue. The 90% confidence limit from the 2014 paper is given in solid red, alongside the expected sensivity from the background model in light red. All other curves are due to data from other experiments; see the paper cited for more information. Figure 2: WIMP parameter space for spin-independent WIMP-nucleon scattering, from 1407.3146v1. Though this particular excess was ultimately not confirmed, these results overall present an optimistic picture for the dark matter search. 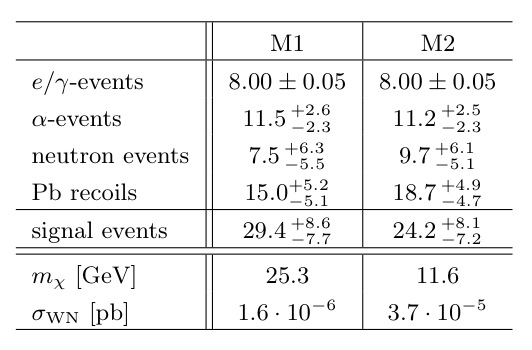 Comparison between the limits from 2011 to 2014 show an much greater sensitivity for WIMP masses below 3 GeV, which were previously un-probed by other experiments. Additional detector improvements may result in even more stringent limit setting, shaping the dark matter search for future experiments.